The best way to begin the day is to be tempted by a nifty, buffet breakfast enriched with delicious, home-made cakes, salty items, marmalades, fresh fruit… and last, but not least, our natural yogurt made by Trento’s milk station. For dinner, not only a selection of the best, regional dishes in 5-course dinner proposals, from starters to the desserts, along with a delicious Teroldego Rotaliano or a Marzemino, as well as a selection of Italian vineyards. Not to be forgotten are the nifty afternoon snacks, particularly beloved by our little Guests and served at the bar, open all day long. For dinner or for any request of our little Guests, our Chefs always reserve a special care and attention. If you are searching for pampers and relaxation, a close-by wellnesspace offers you the possibility of choosing among sauna, swimming pool and why not, even massages. If you do not want to leave your pet(s) home, we will be delighted to welcome them as well and offer them wide spaces to play and run and balconies in any room for little, outdoor breaks. What if you cannot avoid leaving your job home? Our solution is wi-fi connection available all over the hotel. But we pay particular attention to the environment as well: the heating and hot water are supplied by a biomass, eco-friendly boiler which only pours in the air water vapor after combustion of timber and chips’ discards. Through the same way is the whole town of San Martino di Castrozza heated. For everything not mentioned before, the best service is to respond with our maximum availability and flexibility to our Guests. San Martino di Castrozza, Primiero and Vanoi could be chosen as a winter holiday destination for their beautiful mountains alone. This area is ideal for winter activities: from downhill skiing to snowboarding, ski-mountaineering and snowshoeing. Top-quality services and programmed snow systems make it possible to ski all season round. The lifts can be easily reached by the ski bus that links all the resorts. Given its position, this ski area boasts well-packed runs, fast lifts, guaranteed snow and excellent exposure to sun. The San Martino di Castrozza – Passo Rolle ski area enjoys a unique position in the Dolomites: the southern tip of the Dolomiti Superski carousel, it can claim temperatures that are never too severe and countless sunshine days. Perfect maintenance is ensured by as many as 15 snowcats at work every night to prepare the tracks in the best possible way. The recent upgrading of the snow making system ensures now optimal skiing on 95% of the entire ski area throughout the season. In total there are 24 ski-lift facilities in operation, including the fast automatic coupling cableways of Tognola and Colverde and the four-place chairlift of Punta Ces with little plexiglas domes. The new Rosetta cableway, with cabins that can carry 40 people, provides access to the Altopiano dello Pale, an impressive plateau ideal for snow-shoing and ski-touring. Access to the facilities is ensured by a free skibus service. The territory of Paneveggio is located in an area of great contrasts, inside the walls of pinkish Dolomites contrast to the dark rocks of glacial lakes of Lagorai and Cima Bocche, lower green forests and pastures of huts. To allow a more immediate and intuitive reading of the territory has been decided to briefly describe the main environments found within the park, listing their particular characteristics, even in the knowledge that animals, flowers, signs of geological history and the traces of the culture, do not respect borders, but intertwine, overlap, overflow from one side to the other. Along the well marked interlinked paths you can admire majestic peaks of fabulous beauty: Lagorai, Pale di San Martino, the Marmolada, Sass Pordoi, Torri del Sella, Catinaccio, Latemar! Accommodation is guaranteed in selected facilities offering tailor-made services, such as an early breakfast at 6 o’clock. Here you will find a warm welcome and everything you need, including all the material and information necessary for walking in complete safety. All the essentials for an unforgettable trek are arranged in advance, a mountain guide, a packed lunch, transfer and luggage transport, so that you can easily reach the area or areas you have chosen. Technology is also at the service of the trek and you can download the digital maps on your PDA. A wide range of routes are proposed, so you can find the one that suits you best every day. Excursions are the best way to approach a mountain environment. 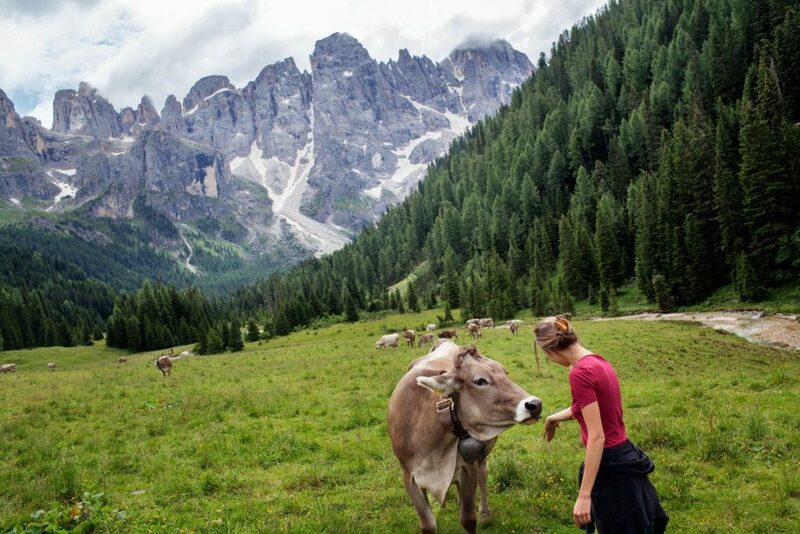 The San Martino di Castrozza and Primiero territory offers a great number of itineraries of various length and difficulty degrees: from simple walks around the villages to the “classic” walks to the Pale refuges, from challenging excursions to trekking from one refuge to the next.